An IVA is a formal solution between you and your creditors that allows you to pay back your debts at an amount that is affordable to you. If you would like to find out more about an IVA or to see if an IVA is the right solution for you to deal with your debts, then fill in the form and we will get in touch. Our IVA advisors will be able to assess your situation, analyse your debts, your income and expenses and determine what all of your options are for getting out of debt. Not only will we provide you with IVA advice, we will be able to guide you through the entire Insolvency Process, should you wish. If an IVA is not the best option for dealing with your debts, then we will be able to let you know what other options you have available. Our expert advisors are friendly and here to chat to you, no matter what your query is. Fill in the form below or give us a call on 0800 043 3328 now. Bankruptcy can be a daunting process. With our helpful guide to bankruptcy, some of your worries and preconceptions can be put to rest. A visit from a bailiff can be a very frightening experience. Some people don't know their rights. Our helpful guide to bailiffs explains your rights. Leading on from Credit Cards, this guick guide gives you an insight to the pros and cons of balance transfers between credit cards. If you have lots of bills and are thinking about consolidating your debts into 1 monthly payment, read our information on Debt Consolidation. Are you confused about Charging Orders and what they are? Or how they work? Our guide to Charging Orders might help. All you need to know about the basics of mortgages, repayment, advantages and disadvantages of the various types of mortgage.
" Very good company for an iva, documents sent out very fast, very understanding people that offer great support and advice would definately reccomend." Work out what your new monthly debt repayment could be by filling in our debt and budget calculator form. 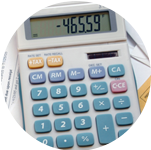 Client was struggling with monthly debt repayments of £560 to several creditors. We were able to have this reduced to £250 per month, with all interest and charges frozen. 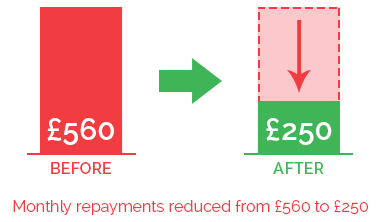 After 60 months of paying this reduced amount she will become debt free and any remaining debt will be written off.